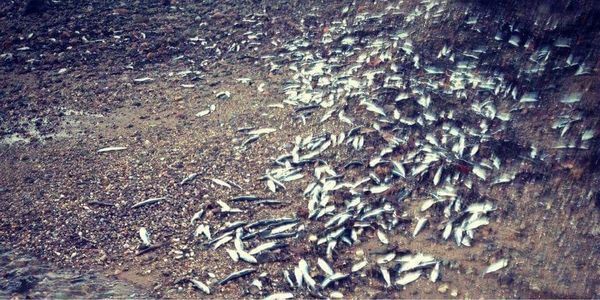 Countless hundreds of thousands of dead herring have washed up on the shores of Nova Scotia. While there are a number of theories as to why, the real reason remains a mystery. And it's not just herring. Dead lobsters, crabs, scallops, starfish, and bar clams have also turned up. We don't know that these deaths are linked, but they are all happening in the same watershed areas. We must take immediate action to discover what is causing the mass death of our sea life, and to stop more animals from dying. Almost six weeks have passed since the original targeted recipients of this petition were informed by Open Letter <https://kentcountynbenvironmentwatch.wordpress.com/2017/01/03/openlettertrudeauleblancmcneilgallant-marinelifeprotectionfundy/> about the concerns that more than 70,000 marine life advocates want addressed. The original addressees for this petition were federal Fisheries and Oceans Minister Dominic LeBlanc, NS Premier McNeil, and NB Premier Gallant. Our Council of Canadians/Kent County NB chapter's Open Letter of Jan 3rd was addressed to these three men as well as Prime Minister Trudeau. None have responded to the content of this petition nor the Open Letter. For its final week, the petition is being readdressed simply to Prime Minister Trudeau. The Prime Minister is where the buck stops, where responsibility for environmental protection, duty of care, due diligence, and good governance ultimately resides. The issues we have been staring at this winter on the Bay of Fundy apply to all marine life, human communities, and oceans on Canada's three coasts. Further follow-up strategies are being developed for when this petition expires. For direct contact on those, email me at <coc.kent.county.nb@gmail.com> . THANK YOU FOR YOUR SUPPORT. Please keep sharing this petition for the final week. I will do one more update if the system allows me, when I close the petition. Why are we making this petition? Since November 22 2016, herring have been beaching themselves on the eastern side of the glorious Bay of Fundy, along Nova Scotia shores from Yarmouth to Digby. This is continuously ongoing. There is no way to tell how many are dead. It seems the Government of Canada does not find the matter sufficiently urgent to send underwater divers to determine the scope and source of the problem. Citizens have rallied to take photos and report their observations as outlined in the document What's Happening to the Humble Herring (written December 14, 2016). What is killing the herring? The potential sources are many, and include parasites, viral and bacterial pathogens, toxins from algea, hypoxia, domestic pollution, fracking wastes, timber industry's 'black liquor', radionuclide releases, agricultural sprays, forestry sprays, farm waste/agricultural dumping, contamination from aquaculture pens, industrial or natural siesmic activity, ocean warming, acidification, forage species reduction, ship bilge releases, a newly installed tidal energy turbine, and many other possibilities. Is it land-based, sea-based, or related to industrial activities somewhere around the Bay? Who is responsible for identifying the cause? The Department of Fisheries & Oceans (DFO) has responsibility for oceans and salt water fisheries, and the Canadian Food Inspection Agency (CFIA) monitors safety of food products from the sea. Samples were collected for analysis but, while additional die-offs are still being reported, the results have not been publically reported. The provinces have responsibility for bottom leases, aquaculture, industrial development, forestry extraction, and other jurisdictions generating toxins than can put marine life at risk. Communities in both provinces are concerned and uninformed but provincial departments in Nova Scotia and New Brunswick have not shown public concern over the issue. Premier of New Brunswick, Brian Gallant. How to ensure no repeat of this boondoggle? Please join us in urging a new approach to the management of our ocean resources that actively involves the responsible authorities AND the public at large. Immediately create a publicized open website where concerned citizens can post abnormal marine events in real time. The website must also provide continuing updates of test results as and when they are available, protocols followed, background information, etc. A voice hot line is essential for the people in our rural areas who do not use computers regularly. Water tests, exploratory dives and other crucial investigatory steps must not be ignored due to lack of personnel or funds. DFO needs proper resources. As well, in many instances, problems could be resolved by DFO working closely with volunteer retired professionals, divers and fishers. Please support by signing the petition and sharing to your friends and neighbours. Wela'liek, Merci, Thanks. Greetings! A full update is in the works; link in NEXT update. Keep sharing petition! No response from governments to our Jan-3-17 Open Letter (link in Update #2). At DFO Jan-5-17 media conference, many questions were answered but many serious issues also emerged there & subsequently. As Council of Canadians, working with fisherfolk/citizen scientists/eNGO's/retired scholars to identify a new strategy for the larger issues. Herring deaths have slowed. Oh, and DFO says it's over, not to worry! Open Letter link: https://kentcountynbenvironmentwatch.wordpress.com/2017/01/03/openlettertrudeauleblancmcneilgallant-marinelifeprotectionfundy/ ....I'll update on responses. Not stopping until govt understands our oceans and marine life need real protection. Petition runs to Jan 22, 2 months after herring deaths began. Then we'll decide what's next. Until then, continue to share this petition and encourage new sign-ons. Yes, together, we can bring back the future for ALL future generations. Hello Marine Life Protectors: Today I planned to send an Open Letter to the 3 Politicians using some of your comments. At midday, Dept. of Fisheries had a media conference. DFO manager Kent Smedbol said "I can't speak for the department" [what?] BUT "personally I don't think there's a great cause for concern." Other opaque and evasive comments were made while admitting they have no idea of the cause. My Letter must be revised. You'll get a link. Continue to share the petition. Thanks for caring.